Independent Expenditures = Third Parties, and my look how they’ve grown! U.S. elections tend to be framed as a context between two ideologies, manifest in two parties. The electoral pattern of two parties is a result of the structural design of our voting districts, which are geographically based with winner-take-all outcomes. But the two parties conceal the diverse and complex attitudes of citizens. For example, many voters care more about environmental issues than the dominant issues emphasized by the two main parties, and these tend to be poorly represented by the 2-party structure. In short, greens are neither red (conservative) or blue (liberal). Indeed, a green voter likely supports nuclear power, carbon taxes, stewardship of nature, and is just as likely to be conservative on fiscal and social issues as liberal. What is exciting is that such extra-partisan ideological viewpoints are able to be expressed in the new political infrastructure. What is often called “third party” politics is in fact extra-party politics: activity and expenditures made outside the 2-party system. Legally, this kind of activity is defined in campaign terms as “independent expenditures” or IEs for short. Want to see what has happened to IEs in recent elections? According to the latest numbers, there were just over $1 billion IEs in the 2012 election cycle, which is more than the previous 20 years combined. The total amount of non-partisan expenditures in 1990, for example, was less than one half of one percent of the current level. Do you the RNC and DNC are happy? Do you think the election laws should be reformed to make the RNC and DNC happy? Don’t cry for the duopoly. The RNC raised $1.023 billion and spent $1.009 billion in this cycle. The DNC raised $1.068 billion and spent $1.067 billion. That’s more than either party raised or spent in 2010 or 2008 or any year ever before. Even so, those three (party 1, party 2, and all non-party expenditures) were amazingly equal, but not likely to stay equal in the years ahead. To be sure, much of the IE money goes for partisan candidates, but that should not obscure the diversity and partisan-blindness of it by nature. Pro-life expenditures will just as happily support red or blue candidates, so long as those candidates are aligned on their core issue. For context, the size of U.S. gross domestic product annually is now around $15,000 billion. The annual advertising budget of local businesses is around $100 billion. Total U.S. advertising is approaching $300 billion. So are elections really being “bought”? Or perhaps should we hope for more money to be spent on politics than on fast food? … Is it the “balanced approach” of the Democrats, which seeks to narrow —but not close —deficits with a mix of tax increases and spending cuts? 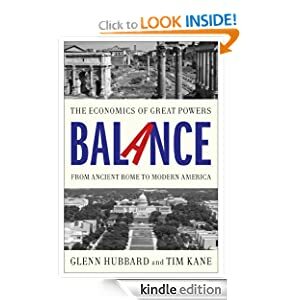 Or is it the “balanced budget” that Republicans now seek, which purports to create a surplus of $7 billion in 2023? Republicans are playing catch-up with Obama, who framed his “balanced approach” formulation during the 2011 debt-limit debate and rode it straight through the election last fall. And they recognize that — as Obama would say — words matter. So much of law depends on good social science, good empirical experience, good modeling of a complex world. That spells ECONOMICS. The crucial implication is this: If you treat all individuals as fundamentally the same in your theoretical constructs, it would be odd to insist that the law should suddenly start treating them differently. P.S. I am not on a Cowen / Times kick at all. Just coincidence that my blog browsing has hooked me twice on Tyler’s insights today! Who owns bank deposits in Cyprus? A. The California governor and legislature confiscate some very large percentage (say, 10%) of all bank deposits of citizens in the state. A liquid wealth tax of the crudest kind. Is such a thing even legal? B. Instead, the state asks Washington, D.C. for a federal bailout. Translation: California asks other state’s taxpayers to pay for past, present, and future spending on its taxpayers. In response, the U.S. Senate says yes to a bailout but only if certain conditions are met: see A above. Is such a thing even legal? In Nicosia, a crowd of about 150 demonstrators gathered in front of the presidential palace late in the afternoon after calls went out on the social media to protest the abrupt decision, which came with almost no warning at the beginning of a three-day religious holiday on the island. Under an emergency deal reached early Saturday in Brussels, a one-time tax of 9.9 percent is to be levied on Cypriot bank deposits of more than €100,000 effective Tuesday, hitting wealthy depositors — mostly Russians who have put vast sums into Cyprus’s banks in recent years. But even deposits of less than that amount are to be taxed at 6.75 percent, meaning that Cypriot creditors will be confiscating money directly from retirees, workers and regular depositors to pay off the bailout tab. This raises some deep, philosophical questions about freedom, property, and individual rights. Should the bank deposits of citizens be protected from national confiscation? I think so. Are the stronger EU states making an error in asking for conditions? No, but this condition is not wise. The whole episode should make us wonder why a country cannot simply use a foreign currency — maybe it can (see Panama’s use of the dollar) but that does not guarantee the government and its foreign-denominated bonds support and backing from the currency maker. Other interesting facts from the CIA factbook, which indicates to me that Cypriots are doing their best to deal with the mess of Greek debt. A shame, not their fault, nor the Germans fault, but where does that leave us? Cyprus experienced numerous downgrades of its credit rating in 2012 and has been cut off from international money markets. The Cypriot economy contracted in 2012 following the writedown of Greek bonds. A liquidity squeeze is choking the financial sector and the real economy as many global investors are uncertain the Cypriot economy can weather the EU crisis. The budget deficit rose to 7.4% of GDP in 2011, a violation of the EU’s budget deficit criteria – no more than 3% of GDP. In response to the country’s deteriorating finances and serious risk of contagion from the Greek debt crisis, Nicosia implemented measures to cut the cost of the state payroll, curb tax evasion, and revamp social benefits, and trimmed the deficit to 4.2% of GDP in 2012. NR editor David French wrote a generous but I think insightful review of Bleeding Talent in their latest print issue (March 25). The link is gated for subscribers only, but it is worth a shout-out here. As a JAG officer, I have advised a series of commanders — both active and reserve — who confront a personnel system that empowers the worst performers while alienating many of the best. At times, it seems as if the Army bureaucracy is almost intentionally designed to take the bravest Americans, place them in an institution of rich traditions, and then slowly drain the idealism and hope from all but the most patient and resilient of them. The feedback remains overwhelmingly positive, from junior officers, enlistees, civilian officials, and yes even senior officers. I’ve yet to run into an eloquent (or ineloquent) defender of the U.S. military HR system as designed. Everyone is frustrated by it, including and especially the professionals tasked with running it!